Today we are going to discuss some growing tips of Onions. Though it is not one of the easiest vegetables to grow, it is not very hard either. You can definitely try your hands on them provided you know some basic information. Onions can be of various types: red, white, or yellow/brown. It can be round, or spindle-shaped. 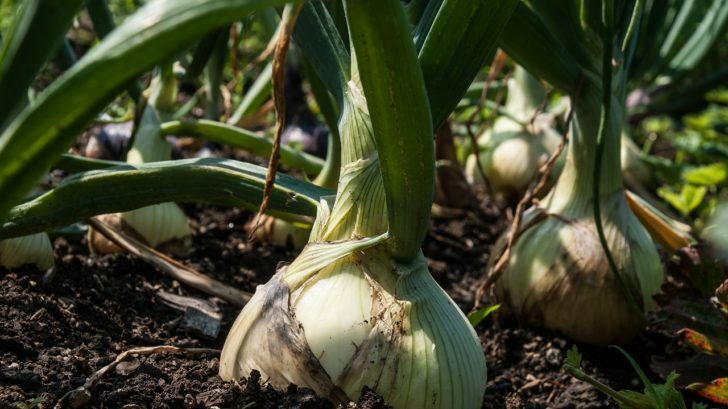 You can grow onions from seeds, smaller bulbs or transplant. If you are planning to start with the seeds, it is better to first grow the seedlings indoors. Use special seedling trays (or can alternatively opt for used Egg cartons) and good quality potting soil. If you are planning to buy transplants from the market, talk to your nearest garden or nursery shop. Though in transplant, the choice of variety is limited, the survival chances are pretty high. You can also grow onions from immature bulbs. The best part of choosing bulb is that it is easy to plant, less disease prone and earliest to harvest. Choose bulbs which are smaller in size (diameter less than ½ inches). The big sized bulbs are much more prone to bolting. Onions need sunny weather. 6 hours of full sunlight is ideal for the plants. Raised garden beds are a very good option for growing onions. It provides warm soil and ideal air circulation to the plant. The ideal pH range is from 6 to 7. If your soil is not in this range you can make it to that region by adding Limestone (if your soil pH is lesser than that), or Peat moss (if your soil pH is greater than that). Adding a sufficient amount of compost also help in reducing the pH of the soil as well as provide the nutrient to the plant. Whatever you do make sure the soil has a very good drainage. Good soil drainage is compulsory for growing onions. Plant them 4” apart. It will make the onions to mature fully. In case you are planning to harvest green onions (scallions), you can leave a smaller space (2”). Onions have a shallow root system. Which means, that the roots can not get water from the depth of the soil and so take it mostly from the surface and little beneath. Which means while watering, you need to make sure the base of the plant doesn’t become dry. Overwatering can also be a problem. One of the sign that your plant is getting more water than needed is a tinge of yellow on the leaves. If you find that happening with your plant, reduce the amount of water. Onions cannot compete with most of the weeds. So make sure your soil has minimal or no weeds. You can check organic weed control to know more about how can you remove weeds from your garden. Using a thick layer of Mulch can be a good idea. Growing onions is all about getting the bulbs. Once you see the top of the plant turns brown or yellow, you should be ready to harvest. Pull or dig the onions out. After that, leave them in the open sun for two days to dry. This will help prevent rotting. After drying, the skin of the onion will have a uniform texture. Now it is time to trim the roots and detach the stem from the bulb. Remove any soil that is present in the skin. These onions are now ready to eat. You can store them in plastic bags and keep them in dry and well-ventilated space. We have discussed how to store various vegetables in our earlier article. You can check that article if you want to know about the basics of vegetable storing. Onion is a very versatile crop. They are used in so many recipes. We are sure you will enjoy the vegetable much more once you grow them in front of your eyes. Have any more questions? Check out FAQs about onion growing. Thanks for the great tips on growing onions! I tried growing them last year, but didn't have much success. I'll have to keep this info in mind this year- I have some onion seeds that I wanted to try to plant. Thanks for onion tips. I grew some from onion sets last summer and they were lovely – much nicer than shop ones. I have never grown them from seeds though – maybe I will try. I planted onions sets in raised beds recently to over winter and get early onions this spring but the rain has been so bad I fear they will be waterlogged.